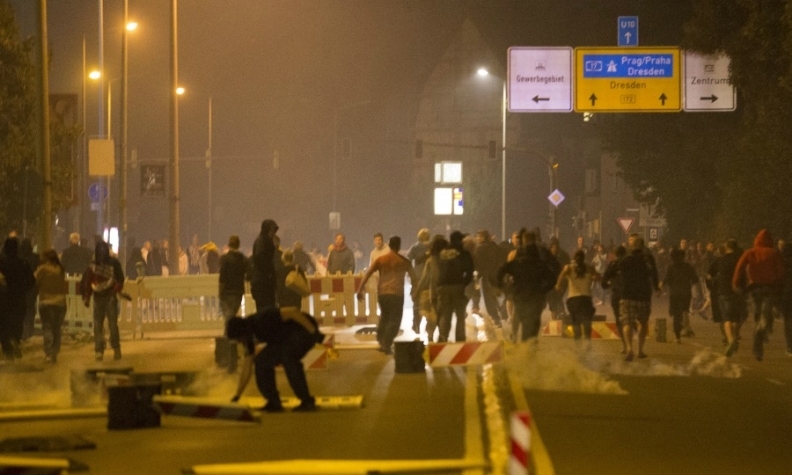 Right wing sympathizers have protested against refugees in cities including Heidenau, shown, in the German state of Saxony. BERLIN (Reuters) -- Saxony, the German state that is home to factories from BMW, Porsche and Volkswagen, is one of the rare economic success stories in eastern Germany, but the area’s politicians are growing worried that a racist backlash against refugees could tarnish its image and deter investments that have turned it into a high-tech hub. The state capital Dresden is the birthplace of the anti-Islam PEGIDA movement, and the town of Heidenau became infamous last summer when anti-refugee riots broke out and Chancellor Angela Merkel was heckled by far-right activists as a "traitor" for her welcoming stance toward migrants. But a series of recent incidents have deepened concern among businesses, politicians and the tourism industry in Saxony that the state could soon pay an economic price for these eruptions of xenophobia. "The headlines, which are raining down on us as citizens and entrepreneurs every day, make it clear that we have a problem," said Heinz Martin Esser, president of Silicon Saxony, a trade association that represents 300 high-tech companies in Europe. "In our high-tech industry we have people from many countries, who play a huge part in our economic community." Last week a video posted online showed a group of about 100 chanting right-wing protesters in the Saxon town of Clausnitz blockading a bus full of refugee families to prevent them from entering a shelter. Children on the bus were seen crying in fear and policemen were seen manhandling the migrants as they pulled them off the bus. The incident, which was condemned by Merkel, was followed by an arson attack on a former hotel in the town of Bautzen that was to be used as a shelter for migrants. Locals applauded as it burned and some tried to obstruct firemen. The technology sector employs some 50,000 people in Saxony, many working for semiconductor firms Infineon and GlobalFoundries, which is owned by Abu Dhabi's Advanced Technology Investment Co (ATIC). VW Group builds the ultraluxury VW Phaeton and Bentley Flying Spur models at its plant in Dresden, while its Porsche unit in Leipzig is responsible for final assembly of the Cayenne SUV and production of the Panamera and the Macan crossover, according to Automotive News Europe's European plant map. BMW Group builds the 1 series, the 2-series coupe and the 2-series Active Tourer alongside its i8 and i3 electric models in Leipzig, the state's biggest city. A sign at the BMW plant's entrance, which like VW Group employs many foreigners, reads: "Respect! No place for racism." The presence of such business heavyweights has helped Saxony post growth of 1.9 percent in 2014, the third-highest yearly rate among Germany's 16 states. It also has an unemployment rate of 8.2 percent, compared with 9.6 percent in the whole of the former east. "For us, it is important that Saxony and the city of Dresden have a reputation as being open to the world and tolerant -- a city where our foreign clients, partners and workers feel comfortable," said a spokesman for Infineon, whose global workforce has more foreigners than Germans. Marketing Dresden, which promotes tourism to the city famous for its imposing Cathedral by the Elbe River, said on Tuesday that the number of visitors last year fell by 3 percent, the first drop since 2008. This was driven by a fall in domestic visitors, put off by anti-Islam rallies. "The damage to the image of our city because of the xenophobic slogans at PEGIDA protests has had a negative impact on tourism," said the group's head Bettina Bunge. Marcel Fratzscher, the head of the Berlin-based DIW economic institute, told German business newspaper Handelsblatt: "Saxony's economy will pay a high economic price for the xenophobia of some of its citizens." State premier Stanislaw Tillich, a member of Merkel's conservative party, has vowed to tackle right-wing extremism with more police and help from social groups. The German federal police told Reuters on Tuesday that 151 crimes against asylum shelters were committed in Germany this year, including 25 arson attacks. Last year, the total was 1,029.